"Think of a marketing student analyzing customer data, a natural and applied sciences student gathering energy usage information, or a math student crunching player stats at a game. The arena is meant to be a live learning laboratory that consistently adds to our students' academic experience in addition to the social one," explained Wiley Davi, Bentley's associate dean of arts and sciences, in a statement. Building energy stats and other data will be available to students for analysis. 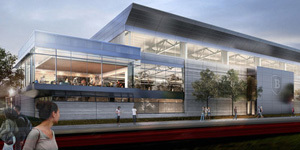 Said Dean of Students and Vice President of Student Affairs J. Andrew Shepardson, "The new Bentley Arena will be far more than a sports venue, providing our students with academic opportunities and our students, alumni, faculty, staff and friends with a 21st century state-of-the-art home."